According to a BBC report, Coventry City Council is willing to consider bids for the Ricoh Arena and the surrounding land. The municipality is aware Coventry City FC aren’t coming back, now it’s time for new business plan for the stadium. Coventry City Council leader Ann Lucas still sees Ricoh Arena as the “rightful home” for Coventry City FC, but appreciates that the club aren’t returning from their exodus. The club currently play in Northampton, while eventually want to move to a new purpose-built stadium just outside the city. This unusual situation left Coventry with a modern football stadium without the anchor tenant it was built to have. Now, according to Lucas, it’s time to consider the stadium’s future without football use altogether. The stalemate follows a rent row, during which Coventry City even refused to host their games here free of rent. Ann Lucas believes the venue will still do great: "In the future we must be committed to consider all options available to not just protect but also maximise the potential of the Ricoh Arena," she said. 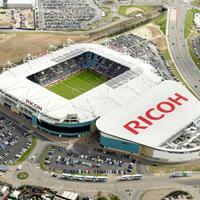 "The Ricoh Arena, and the site around it, has always been about much, much more than a football stadium. "It's about regeneration, jobs creation, a symbol of pride for people in a part of the city that's had more than its fair share of hard times. "And because I want this city to be punching not just at its weight but way above, and I'm in a hurry to make this happen, I am no long prepared for us to be distracted unnecessarily on this issue - as important as it will remain."